That's the usual political adage about autocrats and dictators and while it would be both unfair and simply inaccurate to describe John Delaney as either an autocrat or a dictator, it's remarkable to see how quickly falls the crown. 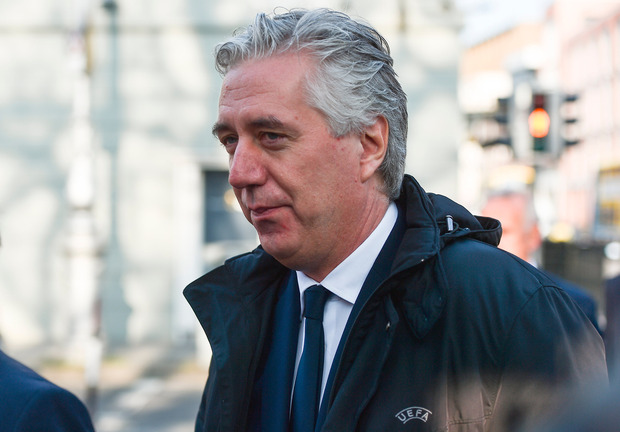 For nigh on 14 years, John Delaney has run the FAI with a velvet glove. But despite the justified grumblings from supporters of the international team, who have long expressed their displeasure with how the most popular sport in the country has been governed, there was always the forlorn sense that John Delaney would just carry on doing whatever he wanted to do. Seemingly oblivious to both the parlous state of the nation's finances and the truly chaotic nature of his own association's bank balance, there was always the impression that the man-who-was-chief before taking up some makey-up job with the FAI, would walk away unscathed from both the bad publicity and sloppy management which has come to symbolise his reign at the helm of the people's game. That fear was understandable - few people seem to represent the old ways of Official Ireland quite as eloquently, and corrosively, as the Waterford man. Another old political adage is that the cover-up will kill you quicker than the crime. But as Delaney's catastrophic appearance at the Oireachtas Committee hearing last week showed a stunned nation, he didn't even feel the need to engage in a cover-up. Instead, he simply batted back the pertinent questions with an almost contemptuous shrug of the shoulders, while parroting the lines that he was precluded from saying anything on the grounds of the legal advice he had received. But legal advice is just that - advice. It's not a warrant or a subpoena. It's not a legal writ that you can't break. It is merely advice - but sometimes, if you're very lucky, you can get the advice that you want to hear. We're all well used to seeing American politicians turning up at Congressional hearings and 'pleading the 5th' on the grounds that anything they say might be used to incriminate them. Usually, those people at least have the common sense to look ashen-faced and embarrassed. In Delaney's case - and this is what ultimately did for him - he had the look of a man who thought he had just come up with a cunning wheeze to get out of answering any awkward questions. But his tone was wrong. His demeanour was dismissive and he had the look of the kind of man we all know only too well - a gilded member of Official Ireland; one of that strange tribe who still think that a bit of glad-handling and plámásing can excuse a multitude of sins. As he discovered to his cost - and what a vast cost that is, when you consider the salary he was on - that stuff doesn't play with the people anymore. Or, indeed, the members of his own association. Much to his undoubted chagrin, the leaks came thick and fast. The revelations about his rent being paid by his employers. The more recent and truly eye-watering credit card activity. Let's not even go back to the €100,000 'bridging loan' that he munificently extended towards the same employers who were paying his rent; an act so mysterious, and still so unexplained, that it may as well be a secret from Fatima. Delaney is a very personable chap, regardless of what some people might say, and the stories of him buying rounds for fans, or being carried shoulder-high from a bar when fans took his shoes, are legendary. But it's hard to imagine his equivalent in the IRFU, Philip Browne, disporting himself in the same fashion. The mortification fans felt when they saw their chief executive behaving like one of the lads on the lash should not be underestimated - Irish football people love their football and take it seriously, and they have no time for the parish-pump style of operating that Delaney often seemed to engage in. This is an important point and one which has been largely overlooked in the recent coverage - Delaney is a symptom of the problem with this country, rather than merely the problem itself. He went around the country dispensing FAI development cheques with all the aplomb of a local TD distributing Lotto funds as if they were from is own pocket. That he did good work for the grassroots in this country is not in doubt. But that was his job, for which he was so handsomely rewarded, and the idea that he should be thanked for merely carrying out his duties is both absurd and so very, very Irish. Following Michael Healy-Rae's fatuous imprecations on his behalf at the Oireachtas hearing, and his even more ludicrous spat with Ivan Yates on Virgin Media last week, it was clear where the battle lines had been drawn - Delaney was one of the good old boys who looked after the people who resent the Dublin 'meeja'. Simply put, he was one of their own. That may play well to the crowd when you're a parochial politician from some rural backwater. But when you're managing an organisation with multi-millions in turnover, and which is supposed to be one of the most important forces for good in this country, it simply doesn't stand up to any rational scrutiny. Healy-Rae's hamfisted defence of Delaney was actually quite similar to Eamon Dunphy's support for Andy Reid and Wes Hoolahan - the message can be overshadowed by the messenger. Delaney, shrewd man that he is, must have known the die was cast when Healy-Rae behaved like a buffoon on his behalf. There is an appetite for vengeance against Delaney. But it should also be remembered that he is a formidable presence within Uefa and, while it is easy to scoff at his defenders, he is a canny operator and that shouldn't be forgotten in the rush to judgment. So, apart from the inevitable Uefa gig, where to now for John Delaney? Some sources in Waterford have suggested that he would easily romp home in an election. But when you look at the remuneration he has received from the FAI in the past, and will continue to receive from Uefa in the future, why would he take the pay cut? This story has yet to run its course but one interesting point has been made in Dáil circles in the last 24 hours - forget about those politicians defending or denouncing him. It's the football-loving TDs who have stayed uncharacteristically quiet who will be the next ones to answer the hard questions. As for the rest of the FAI board? As Noel Rock and Robert Troy pointed out yesterday, extra time is ticking away on them as well.